It might not be easy to choose yourself a new ping pong paddle since there are so many best professional ping pong paddles out there you could purchase. Either if you are a beginner or a really competitive ping pong player, investing in a professional ping pong paddle might be one of the best decisions. Professional ping pong paddle won’t make you a professional player, however, it might be a good boost on top of your skills. Even if you are a beginner, investing in a professional ping pong paddle will make your learning curve smoother and it will have good benefits in a longer run. As I have mentioned earlier, choosing a ping pong paddle can be a hassle, especially if you don’t know much about the ping pong paddles. Luckily for you, I’ll review here some of best ping pong paddles so you will be able to easily choose the new professional ping pong paddle for yourself. As the name says Killerspin, you could have probably guessed that it’s suitable for players who use spin technique often. 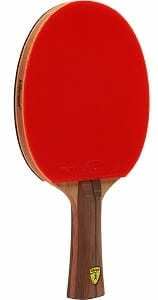 It’s a paddle which is made for an aggressive player offering a lot of power and an excellent spin. It’s a great paddle for speed and attacking style of play as it offers superior looping control. The paddle is a little bit heavier than other but that’s good for the aggressive playing style if offers. Killerspin JET800 is also good for defensive aggressive players who mostly win their points on defense. You will be able to defend firmly while having the ability to attack whenever you get the opportunity. It might take some time to get used on this paddle, however, once you get used, even your servings will improve thanks to the spin it offers. If your weak point is counteracting the opponent’s spin balls, you will be able to counteract it and add more spin & speed to the ball at the same time with this paddle. To play like a professional, you need to have all the necessary equipment. 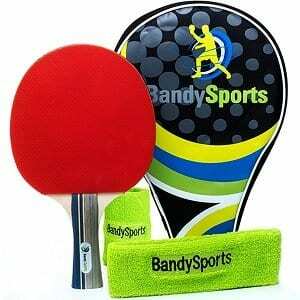 BandySports offers a professional paddle racket with additional sweatbands for forehead and wrists. The paddle is well balanced and it has an optimal weight. You will be able to control the ball and maintain it thanks to the comfortable handle. It’s a great paddle racket for players who want to have the control over the game with speed and spin and that’s what this paddle offers. You will also get the bag which will protect your paddle from scratches and dust. But the best thing about this paddle that comes with additional equipment is the price which is very reasonable. 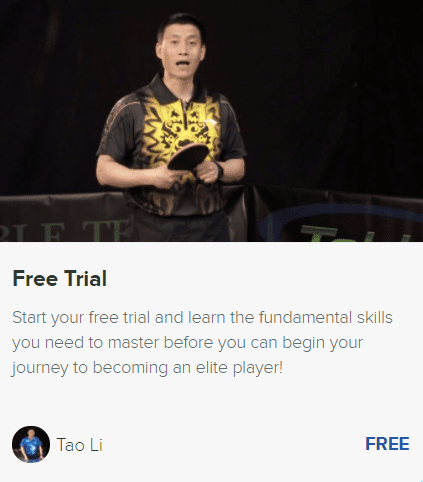 It’s a great ping pong paddle for occasional players, but also for everyone who is becoming more advanced with their skill. This full set paddle offers the best value for the price on the market currently. The name of the paddle says it all. Gambler table tennis paddle is for everyone who is in it to win it. It offers players a good amount of control while having a good speed and spin. It might take you some time to get used to it, but that’s most likely to happen with any new paddle you get. Stick rubber will help you any spin that your opponent gives you. It’s also a little bit heavier than other paddles, but that’s due to the thicker wood which is suitable for the playing style this paddle offers. Balanced players who don’t really know or have their own playing style will love this paddle as it offers a great amount of control while giving you the opportunity to spin the ball at high speeds. Speed and spin will also give you the ability to improve your serves in general. 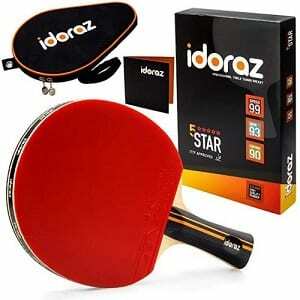 Idoraz table tennis paddle is made to step up your game and instantly see better results. It features an ITTF approved rubbers which are made to deliver master spin and a great balance between speed and control. One thing to mention is that this paddle is incredibly fast. However, it’s not too hard to get used it, thanks to the optimized control and overall great balance between these three – Speed – 99, Spin – 93, Control – 90 and there’s a 2.0mm sponge between the rubbers and a blade with a flared handle. When you aren’t dominating your opponents, you’ll benefit from a professionally made racket case that will keep your racket safe from debris, dust, scratches, and let you take the racket with you anywhere you go. For the price this racket costs, it’s really a great deal which can, after all, help you take your game to another level. The heavier and thicker wood of this paddle will give you the ability to gain speed when hitting the ball while the rubber will give you the ability to add a lot of spin to the ball. 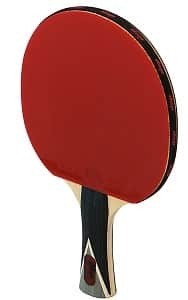 The black side of the paddle comes with more padding than the red side, which offers easier control of the spin balls. You will be able to add spin with during backhand moves too. Defensive players with “shakehand” style of play will benefit a lot with this paddle. Great ergonomics of the paddle offer you a comfortable grip and a full control of it during the game. Paddles don’t make players, yet they improve their skill level and let them find their style of play more easily when being able to play against the harder competition and that’s what the DSP ACE 860 paddle offers. It comes with a bag and the price is really reasonable, so even the players with a tight budget are able to afford a professional paddle. 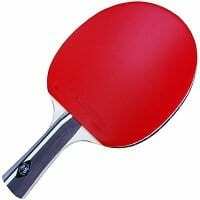 In my opinion, the best professional ping pong paddle from the list above is Killerspin JET800 SPEED N1. It offers an aggressive yet controlling style of play with a lot of speed. It’s a professional paddle which can be great for beginners as well, as it helps them to find their style of play while constantly improving with a smooth learning curve. With the Killerspin JET800 you will be able to improve your skill and playing style to the higher level thanks to the aggressive spin technique. This professional paddle is really worth the price and the quality will definitely make sure the paddle lasts.